That’s what a South Florida DUI manslaughter suspect said of the motorcyclist she was accused of striking and dragging for three miles before she was stopped by sheriff’s deputies on U.S. 41, near Fort Myers. 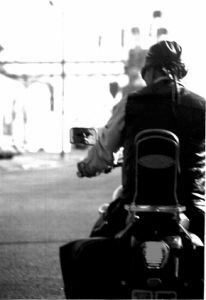 Our Fort Lauderdale DUI defense lawyers know that while many motorcycle crashes are blamed on motor vehicle drivers – especially if they’ve been drinking – the reality is that many motorcyclists make themselves vulnerable to crashes. –Failure to position themselves in the lane most likely to be visible to other motorists. Not all of these are illegal, of course, but they are sometimes overlooked in crash investigations where the operator of the car or truck was deemed intoxicated, despite the fact that one of these may have been a larger factor in the crash than the impairment level of the accused driver. Just because a motor vehicle driver was drinking and was subsequently involved in a crash doesn’t mean that the impairment necessarily led to the crash. Sometimes, it is the actions of the other driver, even if he or she was stone-cold sober. In these cases, the more appropriate charge would be DUI – not DUI manslaughter. The difference in penalties, per Florida Statute 316.193, is a misdemeanor warranting six months in jail versus a second-degree felony punishable by 15 years in prison. Having an experienced defense lawyer to prove these points to the court on your behalf is critical to ensuring a driver is not unduly punished. In this case, the defendant is facing a multitude of serious charges, including DUI manslaughter and property damage, hit and run with death, DUI and careless driving. While the state attorney’s office had initially requested a bail of $250,000, it was reduced by a county judge to $70,000, after it was determined she was not a flight risk. Both she and the motorcyclist were the same age: 54. During her arraignment, prosecutors drug up the fact that she had been arrested more than 12 years ago for DUI while she resided in Michigan. However, she was ultimately convicted of only careless driving. In this case, according to police reports, she had been driving her sport utility vehicle south on U.S. 41 when she made a U-turn at one of the intersections. When she did this, she apparently did not see the motorcycle rider directly ahead of her. She reportedly rear-ended the motorcyclist, who was not wearing a helmet, and then dragged him, and the motorcycle, for approximately three miles before a sheriff’s deputy intervened after seeing sparks flying from underneath her vehicle. The busy stretch of road was shut down for five hours overnight while investigators worked to piece together what happened.